Juste 1 heure au nord de Perth en Australie occidentale. La localité est Caraban - Guilderton, une partie de la région de Moore River dans le comté de Gingin. Maison de vacances riveraine autonome. Spécialistes de l'hébergement pour les grands groupes ou pour deux familles. Pourquoi attendre un long week-end? Moore River Holidays est idéalement situé pour visiter: Mini Golf Caladenia, Gravity Discovery Center, Observatoire Gingin, Jylland Vineyard, Riseborough Estate & Art Gallery, 1300 Trail Rides, Olives Fini, Pinnacles, Lobster Shack, croisières en bateau Moore River Tours et Serendipity Gallery. Ou tout simplement profiter du kayak de notre arrière-cour qui est situé directement sur les rives de la rivière Moore. Very good. 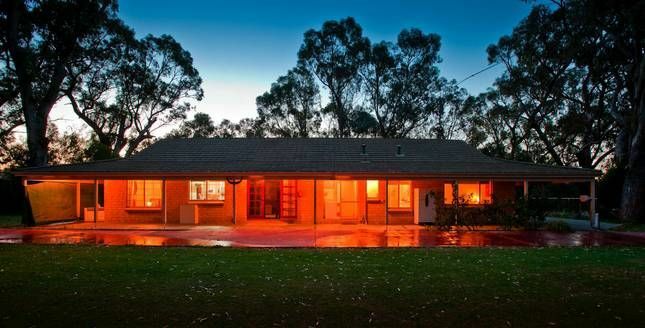 Beautiful farmstay not too far from Perth. I hope your group got to enjoy marshmallow roasting. With peoples busy lives-we only have time to travel one hour around the outskirts of Perth for easy weekenders away, we dont need to rely on long weekends anymore. Fantastic place for a quick get-away with friends and family! Our stay at the Moore River Farm House for 2 nights was fantastic! I had unfortunately encountered a few less than warming responses from other houses on HomeAway that were reluctant to offer accommodation for such a large group of adults (14 adults). Rona was very welcoming from the moment I enquired about the house. She suggested bringing marshmallows to roast on the fire, (depending on the time of year you go) a projector and an old sheet to hang up in the yard and watch movies from. Our group explored the property with an early morning walk, played cricket on the perfectly green backyard and had a BBQ for both nights dinner. There is plenty of room inside the house for 14 adults and even more room outside! And the best bit is you can dance and sing all night on the veranda as there are no neighbours close by. Rona could not have been a better host, thank you Rona! !